The establishment of the Philip J. Currie Dinosaur Museum has had a positive impact on palaeontological field research in the Grande Prairie region. As part of the active research program at the museum, the museum is equipped with a state-of-the-art research laboratory and collections facility.The lab is designed to accommodate specimens discovered and brought in from the field where they undergo preparation, stabilization, and finally curation for display and study. The preparation lab can be viewed by visitors either from the Fossil Lab exhibit or through an overhead viewing glass-panel portal imbedded in the ceiling above the lab. Heavy-duty, compactus style shelving in the collections area and the highly-adaptable mechanical design of the laboratory optimizes its capability to accommodate the widest size range of field jackets. Researchers and students are encouraged to contact our assistant curator to make arrangements to access specimens held in our facility.The last several years has seen more published papers on fossils from the Peace Region than there were in the preceding 50 years. The rich fossil resources, however, still remain under-studied in comparison to areas in southern Canada and the United States. With the opening of the museum, research in the area will receive a much greater focus.In conjunction with the University of Alberta and a dedicated team of volunteers, the museum will work at developing a research program in the area using both currently known sites and searching for new potential areas in the region. With increased presence in the field and dedicated scientists at the museum and the University of Alberta, the amount of research going on in the region will be able to expand in scale and scope.The museum is also now accepting volunteers for our preparation program which is slated to begin in January, 2017. Volunteers will be able to work with fossils to clean and glue them in preparation for eventual study by scientists. To apply to volunteer for this position and others, please download our Volunteer Application and email it to bkelsey@dinomuseum.ca. Learn about some of the recently published projects that been completed in conjunction with researchers from around the world. 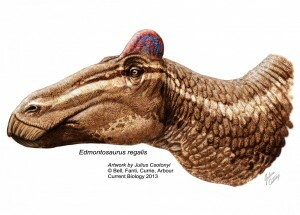 An amazing find of a duck-billed dinosaur near Grande Prairie had preserved skin impressions, showing that it may have had a fleshy crest like that found in some birds. Although they may not look like much, small bits of fossils from places called microsites contain a wealth of information. Microsites are spots where fossils from many different animals have accumulated. They can contain bones from frogs, salamanders, lizards, crocodiles, birds, mammals, and dinosaurs. By studying these microsites, palaeontologists can better understand what kinds of animals would have been living in a single area at a certain point in time. The Grande Prairie region contains numerous microsites, and future work at the museum will involve sorting and identifying the fossils from different locations. The Wapiti Formation not only preserves the hard bones of dinosaurs, but also sometimes preserves the fossil skin impressions of these animals as well. Former museum palaeontologist Dr. Phil Bell recently described a duck-billed dinosaur fossil from the area that had skin impressions of a large, rooster-like comb on top of its head, a feature never seen in dinosaurs like that before. How does a dinosaur grow? One of the best known fossil resources in the Grande Prairie region is the large and dense horned dinosaur bone bed found at Pipestone Creek. Bone beds can play an important role in helping us to understand an entire population of dinosaurs and how dinosaurs may have grown through time. Continued excavations by the museum in conjunction with the University of Alberta are being carried out each summer, and future work on the fossils from the site is ongoing. Recently, some of the best preserved and most interesting fossils to come out of the Grande Prairie region have not been dinosaurs at all, but other animals such as lizards and turtles. In 2010, two lizards, one new to science, were described from Kleskun Hill, just east of Grande Prairie. As well, in the past several field seasons, palaeontologists from the museum in conjunction with the University of Alberta have collected numerous turtle fossils from the area. Understanding the diversity of species in these northern areas is important in reconstructing the climate of the planet during the time of the dinosaurs, and comparisons of all of the fossils in the region, not just the dinosaurs, is useful when comparing the ecosystem to that of southern Alberta and the US.